What Are the Different Types of Scarcity Theory? Supply and demand curves are some of the most important economic principles in the study of scarcity theory. Scarcity theory basically states that demand outstrips supply for any one good. Economists use this principle to understand why consumers make choices under normal or adverse conditions. The different types of scarcity theory include supply and demand, pricing theory, and a review of opportunity costs. Many different types of issues, theories, or traits can go into the study of scarcity theory. In many cases, studies on this topic can be very detailed and take some time to accurately find the single greatest issue creating scarcity. Supply and demand curves are some of the most important economic principles in the study of scarcity theory. When scarcity occurs, it means that either demand has increased greatly or, more importantly, that supply has decreased dramatically. Supply is often the biggest culprit when a good becomes scarce. It can drop due to inefficient production, competitors leaving the market, absent resources, or any other issues with the companies that produce goods. When consumer demand does not change but supply decreases, scarcity begins. Price theory is a key economic study closely related to the review of supply and demand. 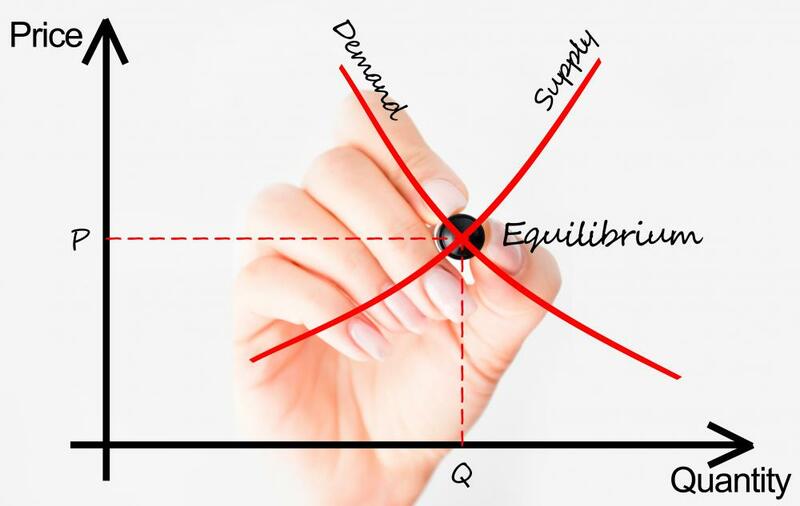 The purpose of supply and demand is to discover the equilibrium price for a good or service. When a product is at its equilibrium price, supply perfectly meets demand for the item. An uptick in prices — due to increased resource cost from the lack of supply, for example — can lead to scarcity as higher prices indicate low supply. Eventually, consumers will be unable to afford the goods due to the price change, forcing them to find a substitute good. Opportunity cost theory is more on the demand side of the scarcity theory, as it deals with consumers. When income goes down, consumers lose purchasing power, and they cannot afford all the items they would normally purchase. When this occurs, consumers must give up the opportunity to purchase one item in favor of another. For example, when the price of a normal good increases, then consumers may need to purchase another good as a replacement. Opportunity costs may result as scarcity due to its natural theory of shifting goods from one group to another. Not all economists believe heavily in the scarcity theory. The opposite is abundance theory, which basically states that capitalist economies will be able to produce more goods than demand will require. Therefore, scarcity will not exist, at least not in the long term. It remains to be seen, however, if the two theories can ever merge. What Causes Scarcity of Resources? What Is the Relationship between Scarcity and Choice? What Are the Causes of Scarcity? What Factors Affect GDP Trends? What Is the Relationship between Scarcity and Opportunity Cost?